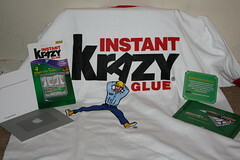 Krazy Glue has made it hard for me to stay upset, because they sent me this finalist prize package as a consolation prize. The truth is, the way my taxes are going to look at the end of the year, it’s probably a good thing for me not to add another all-expense paid trip that I’ll have to pay taxes on. A $250 apple store gift card. The nice thing is, tax-wise, that I can actually spend the gift card on only business expenses, and should be able to write it all off (I’m thinking of a new m-audio input thingy, maybe a USB mic or something). Whatever the case, I’m headed out the door to go buy myself a Hannukah gift (though with the red and green color scheme of the Krazy Glue folks, I should call it an x-mas gift). Did you ever buy your new m-audio device? If not yet; I may have some helpful suggestions for you. I use m-audio myself.